Ranthambore National Park is a vast wildlife reserve near the town of Sawai Madhopur in Rajasthan, northern India. It is a former royal hunting ground and home to tigers, leopards and marsh crocodiles. 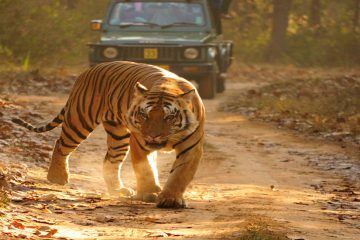 Start this tour from Delhi to drive Ranthambore. In the Morning after breakfast proceed to Ranthambore. On arrival check in Hotel.  Our tour manager will meet you at hotel lobby on your arrival and give you the brief for this Jungle Safari and timings to ready in advance to proceed. Evening you free with your personal activities near at hotel or in the hotel. stay overnight at Hotel in Ranthambore. Ranthambhore National Park:- lies at the junction of the Aravallis and the Vindhya. It is a unique example of natural and historical richness, standing out conspicuously in the vast, arid and denuded tract of eastern Rajasthan, barely 14 kilometers from Sawai Madhopur. Get in tune with the nature for a luxury holiday in the heart of the jungle. It has come to be known as “The land of the Tiger”, where most of the documented footage of this majestic beast has been recorded. Wake up early morning and leave for Jungle Safari in the Ranthambore National Park. Track the tigers and other wildlife through the morning. Return back to the hotel for breakfast. Rest of the morning at leisure. 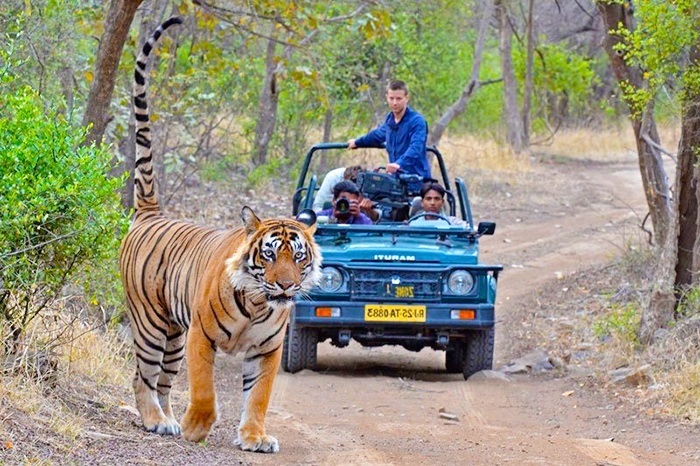 In the afternoon, leave for 2nd Jungle Safari evening free stay overnight at Hotel in Ranthambore. In the morning after breakfast proceed to Delhi. On arrival check in Hotel. Stay overnight at Hotel in Delhi near to Airport that will save your travel for Airport transfer. A safe and comfortable air-conditioned Car with driver, all inclusive. (Fuel for Bus, road and state taxes, toll fees, parking fees, & Driver and driver’s food and lodging). Transfers and land transportation according to itinerary. Tips, laundry, telephone bills, luggage handling and Beverages. The duly signed physical copy of the application form completed in all respect and submitted successfully, is to be submitted at the concerned Indian Visa Application Center (IVAC) or directly to Indian Mission/ Post, on the scheduled date of interview along with the requisite supporting documents. The instructions for filling the form and scheduling the appointment can be seen at Instructions for Online Visa Application. Important technical information for filling online Indian visa application can be referred at Technical Instructions. The applicants are also requested to visit website of the Indian Mission concerned for detailed information about Indian visa. Upon receipt of the Visa Application through Indian Visa Application Center or directly, the Indian Mission/ Post requires a minimum of three working days to process the case and issue a visa depending upon the nationality and excluding special cases. Online India Visa Application allows the Applicant to upload a digital photograph of self to complete the online visa application. The height and width of the Photo must be equal. Photo should present Full face, front view, eyes open. Center head within frame and present full head from top of hair to bottom of chin. Background should be plain light colored or white background. No shadows on the face or on the background. Make sure that photo presents full head from top of hair to bottom of chin. Head should measure 1 inch to 1-3/8 inches (25mm to 35mm). Make sure eye height is between 1-1/8 inches to 1-3. The visa fee depends upon the type of applied for and duration of visa. Visa fee is divided into various types depending upon the case viz; Basic fee, special fee, processing fee by out-sourcing agency. During the online registration process, at the end of the process the basic fee shall be displayed. However, this fee shall be indicative only and final fee shall be charged while submitting the application at the respective counters Fee once received are non-refundable even if the visa application is withdrawn, the visa is not granted, or if visa issued is of shorter duration of period than applied for or otherwise issued or returned at a time or on terms and conditions that may vary from those sought by the applicant. For further information on this, please check with local embassy office or Indian Visa Application center office or websites for information on applicable fee and payment methods. This application form is meant for those foreigners who are applying for visa from outside India. Each online application form is meant for one person only. Separate application has to be filed for each applicant. Furnish information exactly in the manner asked for in the forms, especially the names, address and date of birth. Applicants are required to verify the application details before submitting the online application. They have an option to save the online application form, in case it is not to be submitted. Once the online application form is submitted by the applicant, then further modifications are not allowed. Hence applicants are requested to check and validate the details before submitting the online application form. Applicants are requested to keep the Application Id (generated automatically after the submission of online form) for further communications. Applicant can schedule the appointment as per his/ her convenience with the concerned Indian Mission. Applicant shall access the Visa Application system online through the following link: http://indianvisaonline.gov.in/visa/. Applicant visits the above mentioned web link and selects the Indian Mission from where he intends to apply for the Visa from the tab “Select Mission”. Applicant fills the application on-line as per the forms standardized by the Ministry. After filling the form and submitting it, the system shall automatically generate a Application Id. Applicants are requested to keep this Application Id for further communications with the concerned Indian Mission. If the applicant response is “No”, then it is requested by the applicant to take the print out of the submitted online application form and approach the concerned Indian Mission for submission of the online form along with supporting documents. In case the facility of Appointment Scheduling and e-Payment is not available for the concerned Indian mission, then applicant has to take the printout of the online application form and visit the concerned Indian Mission to submit the same along with supporting documents and make the payment. India’s culture is among the world,s oldest; civilization in India began about 4,500 years ago. Many sources describe it as “Sa Prathama Sanskrati Vishvavara” — the first and the supreme culture in the world, according to the All World Gayatri Pariwar (AWGP) organization. Western societies did not always see the culture of India very favorably, according to Christina De Rossi, an anthropologist at Barnet and Southgate College in London. Early anthropologists once considered culture as an evolutionary process, and ”every aspect of human development was seen as driven by evolution,” she told Live Science. “In this view, societies outside of Europe or North America, or societies that did not follow the European or Western way of life, were considered primitive and culturally inferior. Essentially this included all the colonized countries and people, such as African countries, India, and the Far East.”. However, Indians made significant advances in architecture (Taj Mahal), mathematics (the invention of zero) and medicine (Ayurveda). Today, India is a very diverse country, with more than 1.2 billion people, according to the CIA World Factbook, making it the second most populous nation after China. Different regions have their own distinct cultures. Language, religion, food and the arts are just some of the various aspects of Indian culture. Here is a brief overview of the culture of India. India has 28 states and seven territories, according to the World Health Organization. There is no official language in India, according to a Gujarat High Court ruling in 2010. Many people living in India also write in Devanagari script. In fact, it is a misconception that the majority of people in India speak Hindi. Though many people speak Hindi in India, 59 percent of India residents speak something other than Hindi, according to The Times of India. Bengali, Telugu, Marathi, Tamil and Urdu are some other languages spoken in the country. India is identified as the birthplace of Hinduism and Buddhism, the third and fourth largest religions. About 84 percent of the population identifies as Hindu, according to the “Handbook of Research on Development and Religion” Edited by Matthew Clarke (Edward Elgar Publishing, 2013). There are many variations of Hinduism, and four predominant sects — Shaiva, Vaishnava, Shakteya and Smarta. When the Moghul Empire invaded during the sixteenth century, they left a significant mark on the Indian cuisine, according to Texas A&M University. Indian cuisine is also influenced by many other countries. It is known for its large assortment of dishes and its liberal use of herbs and spices. Cooking styles vary from region to region. Many Hindus are vegetarians, but lamb and chicken are common in main dishes for non-vegetarians. The Guardian reports that between 20 percent and 40 percent of India’s population is vegetarian. The most well-known example of Indian architecture is the Taj Mahal, built by Mughal emperor Shah Jahan to honor his third wife, Mumtaz Mahal. It combines elements from Islamic, Persian, Ottoman Turkish and Indian architectural styles. India also has many ancient temples. India is well known for its film industry, which is often referred to as Bollywood. The country’s movie history began in 1896 when the Lumière brothers demonstrated the art of cinema in Mumbai, according to the Golden Globes. Today, the films are known for their elaborate singing and dancing. Indian dance, music and theater traditions span back more than 2,000 years, according to Nilima Bhadbhade, author of “Contract Law in India” (Kluwer Law International, 2010). The major classical dance traditions — Bharata Natyam, Kathak, Odissi, Manipuri, Kuchipudi, Mohiniattam and Kathakali — draw on themes from mythology and literature and have rigid presentation rules. The country celebrates Republic Day (Jan. 26), Independence Day (Aug. 15) and Mahatma Gandhi’s Birthday (Oct. 2). Diwali is the largest and most important holiday to India, according to National Geographic. It is a five-day festival known as the festival of lights because of the lights lit during the celebration to symbolize the inner light that protects them from spiritual darkness. Holi, the festival of colors, also called the festival of love, is popular in the spring. 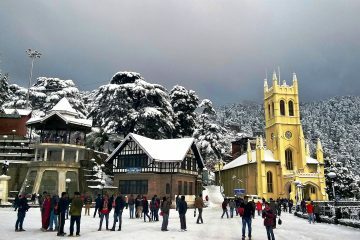 The climate in India varies from a tropical monsoon climate in the south to a temperate climate in the north. 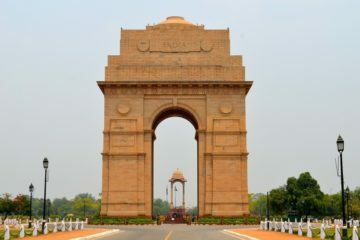 If you are thinking of Visiting Delhi (the capital of India) then best to visit it in October, November, February and March. That’s when the nights are cool and the days are filled with a little sunshine. May, June and July are very hot with temperatures over 45 degrees (113 Fahrenheit). It is a dry heat and is sometimes accompanied by dusty desert winds. Most of the rain falls between July and September but they are not the tropical rains you’ll experience in India’s coastal cities. © Abyss Tours 2018 All Rights Reserved.